Filling the middle and deep dermis. Cross linked hyaluronic acid combination of cross-linked and non cross linked hyaluronic acid. 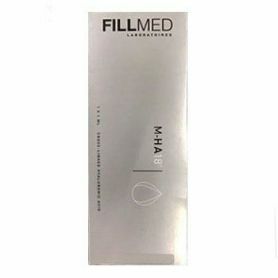 FILLMED® X-HA Volume is a hyaluronic acid based dermal filler used to reshape and redefine contours of the areas of the face that have lost volume. Is used in the deep dermis to restore or add volume to areas of the face such as the facial ovale, cheeks, cheekbones, chin, and the temples. HYALURONIC ACID VOLUMIZING IMPLANT TO REDEFINE FACIAL VOLUME. X-HA is an injectable, sterile, biodegradable, viscoelastic, transparent, colorless, isotonic and homogenized gel. X-HA Volume contains a cross-linked hyaluronic acid produced by a bacterium, Streptococcus equi, formulated at a concentration of 23mg/ml in physiological buffer. FILLMED X-HA Volume is used in the deep dermis to restore or add volume to areas of the face such as the facial ovale, cheeks, cheekbones, chin, and the temples. To correct wrinkles and restore facial volume instantly, laboratories Filorga innovate with the first cross-linked hyaluronic acid versatile, X-HA. X-HA Volume® has a very high viscosity to resist to deformations and create volume. X-HA Volume® is twice as volumizing as X-HA3. Filorga X HA Volume is a highly effective dermal filler for treating fine lines and wrinkles. Hyaluronic acid volumizing implant to redefine facial volumes. X-HA Volume contains hyaluronic acid which is a natural part of tissue repair in the body, making it ideal for providing a natural approach to anti-aging with long lasting results. Its viscosity is twice as high as x-hA3®. Tampon phosphate q.s. pour un pH à 6.8-7.4. Filling of deep surface wrinkles, facial contours and volumes. Cheek, Cheekbones, Chin; Face oval, Temporal area. X HA Volume can be injected in deep dermis. Injected along the wrinkles, hyaluronic acid plumps them from within, injected into the cheeks, he reshapes and redefines the oval of the face, lips, it restates their contour and gives them a natural arched. Thanks to its high viscosity, X-HA® Volume can be easily injected with a non traumatic needle. Fillers Filorga X-HA® contain hyaluronic acid and are used to make instant corrections of wrinkles, restore skin volume, and redraw the contours of the face. X-HA®, the Filorga anti-aging solution for natural results, harmonious and sustainable. Filorga X-fillers allow HA® of inflating Interior wrinkles, to shape the facial features, correction of forehead wrinkles, to restore the volume of the cheekbones, to redraw the contours of the lips, to reshape the face.